Katherine E. Dederich was born in 1903 at Wisconsin. She was the daughter of John Adolf Dederich and Katherine E. Ruland. 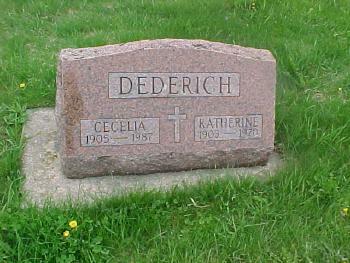 Katherine E. Dederich was buried in 1970 at St. Patrick's Catholic Cemetery; New Loreto, Bear Creek, Sauk, Wisconsin. [S244] U.S. Federal Census 1910 U.S. Federal Census, by Ancestry.com, ED94. Dwelling 110. [S250] U.S. Federal Census 1930 U.S. Federal Census, by Ancestry.com, ED52-9. Dwelling 187. Leo N. Dederich married Margaret M. McCluskey, daughter of John J. McCluskey and Mary C. Rainy. Leo N. Dederich was born on 24 May 1911 at Wisconsin. He was the son of John Adolf Dederich and Katherine E. Ruland. 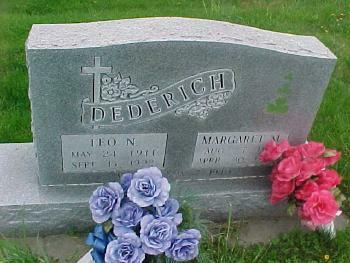 Leo N. Dederich died on 15 September 1992 at Sauk, Wisconsin, at age 81. He was buried after 15 September 1992 at St. Patrick's Catholic Cemetery; New Loreto, Bear Creek, Sauk, Wisconsin. Leo N. Dederich obtained US Social Security Card at Wisconsin; last residence Plain, Sauk, Wisconsin. Peter Weitzel was born in March 1830 at Prussia. He was the son of Jacob Weitzel Sr. and Margaret Gehart. Peter Weitzel married Mary Zeckman circa 1856. Peter Weitzel died on 15 January 1910 at age 79. Peter Weitzel immigrated in 1836. [S249] U.S. Federal Census 1850 U.S. Federal Census, by Ancestry.com, Stamp 433. Dwelling 1184. [S247] U.S. Federal Census 1870 U.S. Federal Census, by Ancestry.com, Page 28. Dwelling 206. Married Name circa 1856 As of circa 1856,her married name was Weitzel. Mary Zeckman was born in January 1836 at Austria. She married Peter Weitzel, son of Jacob Weitzel Sr. and Margaret Gehart, circa 1856. Mary Zeckman died in 1902. Mary Zeckman immigrated in 1851. She had 11 with 10 living in 1900 children. Henry Weitzel was baptized in 1856 The first mass in the town of Ithaca was held by Father Max Gardner, at the house of William Misslich, in November, 1856, and this finally resulted in the organization of St. Mary's Catholic Church. Father Gardner was at that time a resident of Sauk county, and knowing there were people here in the wilderness without a spiritual advisor, he started out on foot and alone for this little German settlement. He was gladly welcomed and the people gathered at the house of William Misslich, as stated. There were four children baptized at this time --- Agnes, daughter of Albert and Mary A Misslich; Henry, a son of Peter and Mary Wertzel [Weitzel]; Gertrude, daughter of Joseph and Barbara Bodendine; and Maggie, daughter of Jacob and Catharine Weitzel. He was born in 1856 at Wisconsin. Henry Weitzel died on 22 February 1934. Name Variation Theresa R. Weitzel was also known as Theressa. Married Name 15 September 1887 As of 15 September 1887,her married name was Haskin. Theresa R. Weitzel was born in 1867 at Richland, Wisconsin. 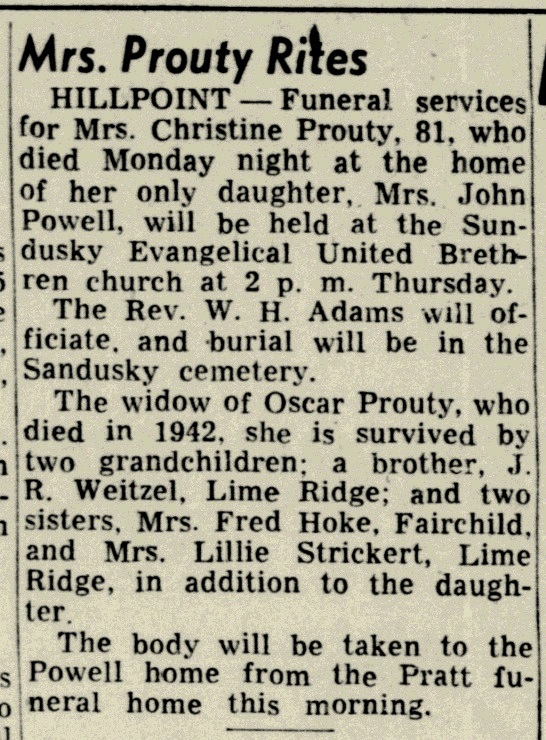 She was the daughter of Peter Weitzel and Mary Zeckman. Theresa R. Weitzel married Ervin Lincoln Haskin on 15 September 1887 at Dane, Wisconsin. Theresa R. Weitzel was buried in 1945 at Foxhome Township Cemetery, Foxhome, Wilkin, Minnesota. She died in 1945 at Minnesota. Married Name 18 January 1897 As of 18 January 1897,her married name was Prouty. Christina Weitzel was born in September 1869 at Wisconsin. Christina Weitzel married William Oscar Prouty, son of Joshua Prouty and Elizabeth Freeman, on 18 January 1897 at Sauk, Wisconsin. 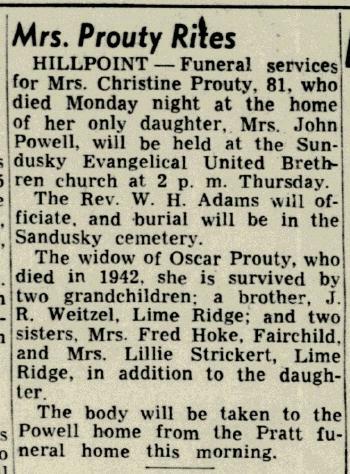 Christina Weitzel died on 9 April 1951 at at the home of her only daughter, Mrs. John Powell, at age 81 obituary listed in the Madison Wisconsin State Journal on April 11, 1951; also reported as 09 Apr 1952. Christina Weitzel had 1 with 1 living in 1900 children. Jacob R. Weitzel was born in September 1871 at Wisconsin. Jacob R. Weitzel married Laura M. Powell on 5 August 1903 at Sauk, Wisconsin. Jacob R. Weitzel died in 1956 at Wisconsin. Name Variation Frances A. Weitzel was also known as Fannie. Married Name 26 September 1896 As of 26 September 1896,her married name was Hoke. 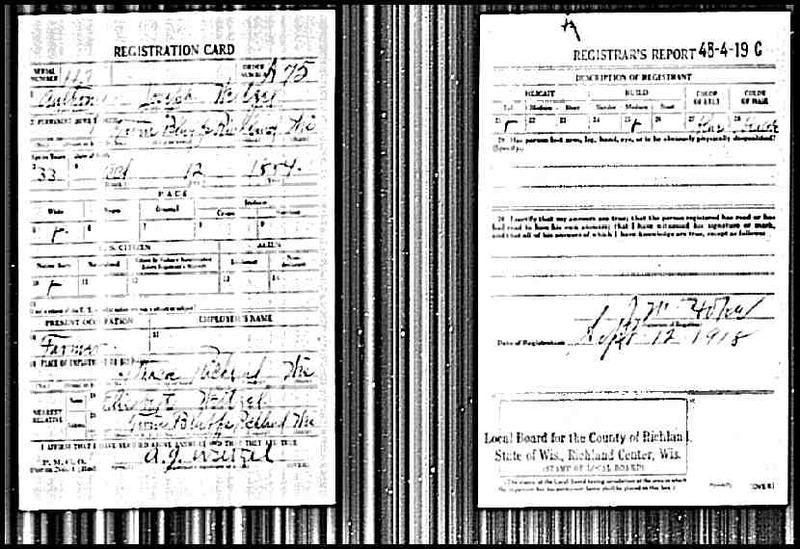 Frances A. Weitzel was born on 22 August 1872 at Wisconsin also reported as Aug 1873. Frances A. Weitzel married Frederick H. Hoke, son of George Mathias Hoke and Marian Johnson, on 26 September 1896. Name Variation Lillie R. Weitzel was also known as Lily. Married Name Her married name was Strickert. Married Name Her married name was Reitman. Lillie R. Weitzel married Anton F. Strickert at second marriage for her. Lillie R. Weitzel was born in 1879 at Wisconsin. Lillie R. Weitzel died on 29 March 1953. Name Variation Anthony Joseph Weitzel was also known as A. J.
Anthony Joseph Weitzel was born on 12 October 1884 at Wisconsin. He was the son of Joseph J. Weitzel and Clara Josephine Huebsch. Anthony Joseph Weitzel married Elizabeth Margaret McPhillips, daughter of Patrick McPhillips and Catherine Byrne, circa 1909. 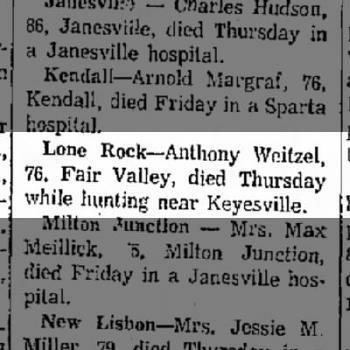 Anthony Joseph Weitzel died on 28 December 1960 at Richland, Wisconsin, at age 76 Anthony Weitzel, 76, Fair Valley, died Thursday (28 Dec 1960) while hunting near Keyesville. He was buried after 28 December 1960 at Saint Marys Cemetery, Keyesville, Richland, Wisconsin. [S244] U.S. Federal Census 1910 U.S. Federal Census, by Ancestry.com, ED94. Dwelling 117. [S250] U.S. Federal Census 1930 U.S. Federal Census, by Ancestry.com, ED56-8. Dwelling 98. Name Variation Elizabeth Margaret McPhillips was also known as Lillian. Name Variation Elizabeth Margaret McPhillips was also known as Elizabeth Lillian. Name Variation Elizabeth Margaret McPhillips was also known as Lillie. Married Name circa 1909 As of circa 1909,her married name was Weitzel. Elizabeth Margaret McPhillips was born on 21 June 1886 at Wisconsin. Elizabeth Margaret McPhillips married Anthony Joseph Weitzel, son of Joseph J. Weitzel and Clara Josephine Huebsch, circa 1909. 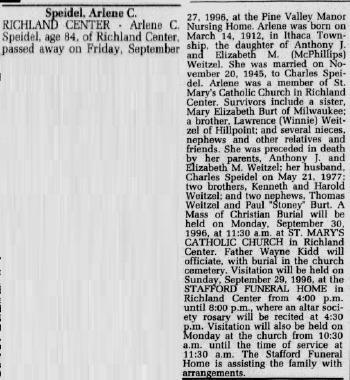 Elizabeth Margaret McPhillips died on 8 July 1970 at age 84 Mrs Elizabeth (McPhillips) Weitzel obituary. She was buried after 8 July 1970 at Saint Marys Cemetery, Keyesville, Richland, Wisconsin. 1905 Bear Creek, Sauk, Wisconsin Elizabeth Margaret McPhillips appeared on the census of 1905 in the household of Patrick McPhillips at Bear Creek, Sauk, Wisconsin. Kenneth Raphael Weitzel Sr. was born on 31 July 1910 at Wisconsin. He was the son of Anthony Joseph Weitzel and Elizabeth Margaret McPhillips. 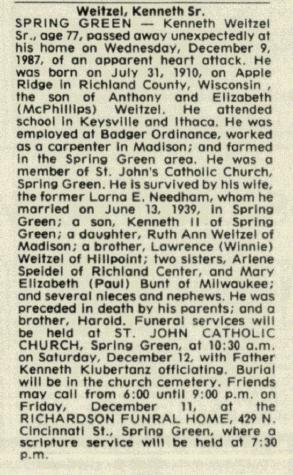 Kenneth Raphael Weitzel Sr. married Lorna Elizabeth Needham, daughter of Joseph Edward Needham and Elizabeth M. Bindl, on 13 June 1939 at Spring Green, Sauk, Wisconsin. 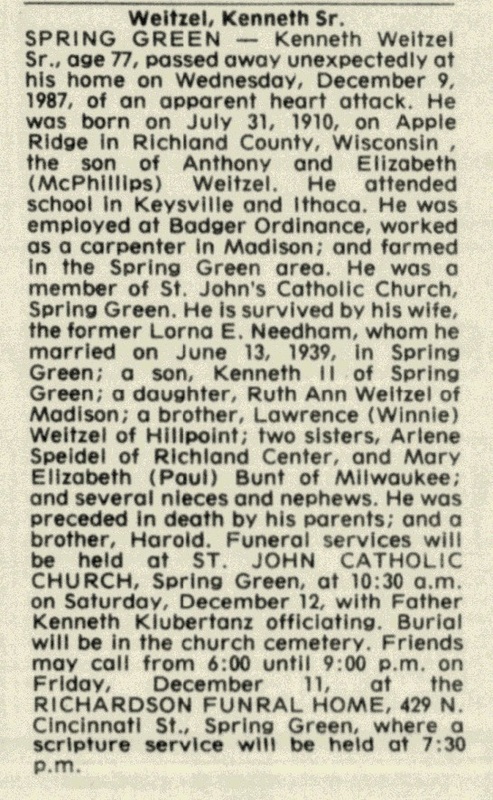 Kenneth Raphael Weitzel Sr. died on 9 December 1987 at at home, Wisconsin, at age 77 Kenneth Weitzel Sr obituary. He was buried after 9 December 1987 at Saint John the Evangelist Catholic Cemetery, Spring Green, Sauk, Wisconsin. Kenneth Raphael Weitzel Sr. obtained US Social Security Card at Wisconsin; last residence Spring Green, Sauk, Wisconsin. Married Name 20 November 1945 As of 20 November 1945,her married name was Speidel. Arlene Catherine Weitzel was born on 14 March 1912 at Wisconsin. She was the daughter of Anthony Joseph Weitzel and Elizabeth Margaret McPhillips. Arlene Catherine Weitzel married Charles H. Speidel, son of Lester Speidel and Gunda Hanson, on 20 November 1945. 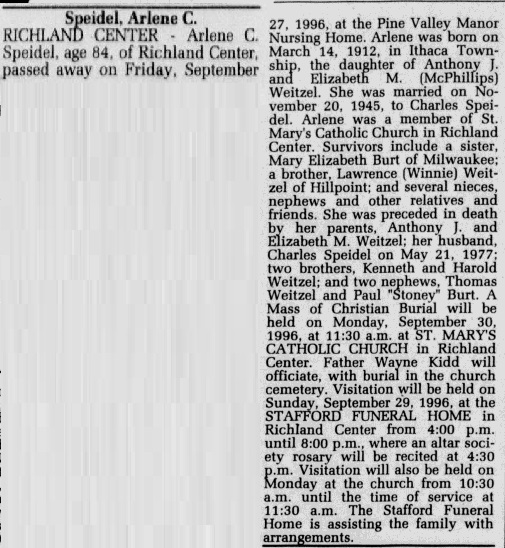 Arlene Catherine Weitzel died on 27 September 1996 at age 84 Arlene (Weitzel) Speidel obituary. Name Variation Lawrence Jacob Weitzel was also known as Larry. Lawrence Jacob Weitzel was born on 2 July 1918 at Richland, Wisconsin. Lawrence Jacob Weitzel married Winnifred Lucille Bailey, daughter of Orville John Bailey and Sylvia Martin, on 22 April 1950. Lawrence Jacob Weitzel died on 19 October 1999 at age 81. He was buried after 19 October 1999 at Saint Marys Cemetery, Keyesville, Richland, Wisconsin. Lawrence Jacob Weitzel obtained US Social Security Card at Wisconsin; last residence Hillpoint, Sauk, Wisconsin. Ellen Weitzel was born in October 1861 at Wisconsin. Ellen Weitzel died before 1951. Name Variation Rolland P. Weitzel was also known as Roland. Rolland P. Weitzel was born on 10 September 1901 at Wisconsin. He was the son of Joseph Herman Weitzel and Carrie Constantine. Rolland P. Weitzel died on 29 July 1918 at age 16. Donald Ross Weitzel married Lina Margaret Hunt, daughter of John Thomas Hunt and Iva Irene Risley. Donald Ross Weitzel was born in 1910 at Wisconsin. Donald Ross Weitzel died in 1973. Name Variation Elvira Kennedy was also known as Alvina. Name Variation Elvira Kennedy was also known as Alvira. Married Name circa 1868 As of circa 1868,her married name was Constantine. Elvira Kennedy was born in October 1851 at Ohio. She was the daughter of (?) Kennedy. Elvira Kennedy married Peter Constantine circa 1868. Elvira Kennedy died on 27 June 1921 at age 69. Elvira Kennedy had 7 with 6 living in 1900 children. She had 7 with 6 living in 1910 children. [S247] U.S. Federal Census 1870 U.S. Federal Census, by Ancestry.com, Year: 1870; Census Place: Willow, Richland, Wisconsin; Roll: M593_1734; Page: 755B; Image: 414; Family History Library Film: 553233. [S246] U.S. Federal Census 1880 U.S. Federal Census, by Ancestry.com, NA Film Number T9-1446 Page Number 265C. [S245] U.S. Federal Census 1900 U.S. Federal Census, by Ancestry.com, ED148. Dwelling 107. [S244] U.S. Federal Census 1910 U.S. Federal Census, by Ancestry.com, ED129. Dwelling 157. Peter Constantine was born in June 1842 at New York. He married Elvira Kennedy, daughter of (?) Kennedy, circa 1868. Peter Constantine died in 1917 CO. K. 101 REG. N.Y. INF. Name Variation Blanche Constantine was also known as Cora Blanche. Blanche Constantine married Clayton Prouty, son of Hiram Prouty and Martha Jane Emery. Blanche Constantine was born in September 1887 at Wisconsin. Blanche Constantine died on 30 March 1971 at age 83. [S243] U.S. Federal Census 1920 U.S. Federal Census, by Ancestry.com, Year: 1920;Census Place: Bear Creek, Sauk, Wisconsin; Roll: T625_2015; Page: 1A; Enumeration District: 160; Image: 8. Name Variation Susan Frances Campbell was also known as Susie. Name Variation Susan Frances Campbell was also known as Susan Francis. Married Name circa 1885 As of circa 1885,her married name was Hoxie. Susan Frances Campbell was born in January 1869 at Wisconsin tombstone reported birth year as 1868. She was the daughter of Isaac Campbell and Mary Gernert. Susan Frances Campbell married James Herbert Hoxie, son of Silas Paddack Hoxie and Elmina L. Cass, circa 1885. Susan Frances Campbell died in 1924. Susan Frances Campbell had 4 with 4 living in 1900 children. [S245] U.S. Federal Census 1900 U.S. Federal Census, by Ancestry.com, ED147. Dwelling 56. [S243] U.S. Federal Census 1920 U.S. Federal Census, by Ancestry.com, ED180. Dwelling 35. Married Name Her married name was Jensen. Name Variation Clara Hoxie was also known as Clarris. Clara Hoxie was born in January 1887 at Wisconsin. She was the daughter of James Herbert Hoxie and Susan Frances Campbell. Bert Silas Hoxie was born in May 1888 at Wisconsin. He was the son of James Herbert Hoxie and Susan Frances Campbell. Bert Silas Hoxie married Genevieve M. Schaffner, daughter of Louis Schaffner, circa 1919. Name Variation Floria Hoxie was also known as Flora. Floria Hoxie was born in April 1892 at Wisconsin. Married Name 17 May 1915 As of 17 May 1915,her married name was Ferris. Married Name 17 May 1915 As of 17 May 1915,her married name was Farris. Nettie Mae Hoxie was born in September 1895 at Wisconsin. Nettie Mae Hoxie married Henry John Farris, son of Marion James Farris and Caroline Marie Sorg, on 17 May 1915 also reported as 1910. Nettie Mae Hoxie died on 28 August 1953 at age 57. Married Name circa 1919 As of circa 1919,her married name was Hoxie. Genevieve M. Schaffner was born circa 1901 at Illinois. She was the daughter of Louis Schaffner. Genevieve M. Schaffner married Bert Silas Hoxie, son of James Herbert Hoxie and Susan Frances Campbell, circa 1919. Wilbur J. Hoxie was born on 19 December 1920 at Wisconsin. Wilbur J. Hoxie died in October 1956 at age 35. 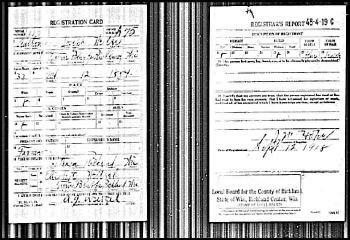 Wilbur J. Hoxie obtained US Social Security Card at Wisconsin; last residence not specified. On 31 August 1942 at U.S. World War II Army Enlistment, Milwaukee, Wisconsin, Name: Wilbur J Hoxie Birth Year: 1920 Race: White, citizen (White) Nativity State or Country: Wisconsin State: Wisconsin County or City: Dane Enlistment Date: 31 Aug 1942 Enlistment State: Wisconsin Enlistment City: Milwaukee Branch: Branch Immaterial - Warrant Officers, USA Branch Code: Branch Immaterial - Warrant Officers, USA Grade: Private Grade Code: Private Term of Enlistment: Enlistment for the duration of the War or other emergency, plus six months, subject to the discretion of the President or otherwise according to law Component: Selectees (Enlisted Men) Source: Civil Life Education: 2 years of college Marital Status: Single, without dependents Height: 72 Weight: 143. Violet Cass was the daughter of Otis Cass. Violet Cass died in 1985. George B. Holmes was born in February 1864 at England. He was the son of (?) Holmes and Louisa (?). George B. Holmes married Lillian Belle Hoxie, daughter of Silas Paddack Hoxie and Elmina L. Cass, circa 1887. George B. Holmes died in 1932. George B. Holmes immigrated with Louisa (?) in 1868. George B. Holmes witnessed the adoption of Glenn Churchill Holmes after June 1900. [S245] U.S. Federal Census 1900 U.S. Federal Census, by Ancestry.com, ED145. Dwelling 124.